Everyday millions of people click on hyperlinks without knowing the source of the information they are about to view. Insulated from the physical location of the data, the user just clicks and the protocols do the rest. The Globus Toolkit® is designed to the same kind of thing only instead of linking users to data, Globus will link users to computational resources. Just as you do not know (or care) where your electricity was generated, so it may be with your computing cycles. Grid computing holds great promise for the HPC cluster community. It is not intended to replace clusters nor will it turn every corporate LAN into a top500 cluster. Indeed, clusters may very well become the powerplants of the computational Grid. A Grid must coordinate resources that are not subject to centralized control. A Grid must deliver nontrivial qualities of service (e.g., relating to response time, throughput, availability, and security) for co-allocating multiple resource types to meet complex user demands. Such a system gives users the ability to make resources available to others and to access others' resources. These resources can include data archives, computers, instrumentation, and networks. The Grid has grown through a strategy of open source and open standards, similar to that of the Linux operating system, and distinct from proprietary attempts at resource-sharing software. This strategy encourages broader, more rapid adoption and leads to greater technical innovation, as the open-source community provides continual enhancements to the product. Nevertheless, realizing the full promise of the Grid requires solutions to fundamental issues of authentication, authorization, resource discovery, resource access, and most notably incompatibility of resources and policies for managing them. A wide variety of projects and products, for example, Condor-G, the Network Weather Service, myProxy, MPICH-G2, Sun Grid Engine, Platform LSF, and EU DataGrid offer services intended to address these issues. Here, we focus on the Globus Toolkit that underlies these various systems and that provides the basis for most deployments of Grid technology. The Globus Toolkit was conceived to remove obstacles that prevent seamless collaboration. Its core services, interfaces, and protocols allow users to access remote resources as if these resources were located within the users' own machine room, while simultaneously preserving local control over who can use resources and when. Included in the Globus Toolkit are software development kits to help programmers design and operate their own Grid applications. The current version, GT4, implements the protocols, APIs, and Grid services required for addressing security, data transfer, remote job submission, and discovery of resources and services. GT4 is based on industry standard Web services technologies and the Open Grid Services Infrastructure (OGSI), a technical specification recently approved by the Global Grid Forum, the international community and standards organization that defines technical standards for Grid computing OGSI specifies a set of "service primitives" that establish a nucleus of behavior common to all Grid/Web services that can be leveraged by meta- and system-level services. (Grid services are Web services that conform to a specific set of conventions.) OGSI is part of a broader, emerging Open Grid Services Architecture being designed to facilitate creation both of applications and of the infrastructure such applications require. Let's take a look at major parts of the Globus Toolkit. The toolkit provides, in addition to its OGSI core, a set of modular, complementary components: GRAM (Globus Resource Allocation and Management), which implements a resource management protocol; MDS (Monitoring and Discovery Service), which implements an information services protocol; and GridFTP, which implements a data transfer protocol. Each one uses the GSI (Grid Security Infrastructure) protocol to ensure the security of Globus Toolkit-initiated authentication and communication processes. GRAM is based on a layered architecture where high-level global resource management services are built atop local organizations' resource allocation services. A standardized GRAM interface gives access to a variety of local resource management tools that a site might have in place, such as Load Sharing Facility (LSF), Network Queuing Environment (NQE), LoadLeveler, and Condor. 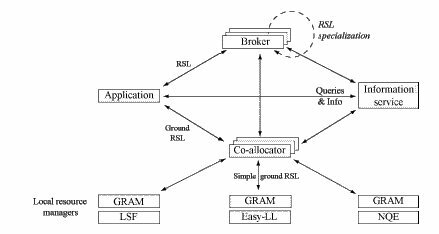 Figure One shows the three primary resource allocation and management components: an extensible Resource Specification Language (RSL), an interface to local resource management tools (GRAM itself), and a co-allocator (DUROC). MDS provides tools to enable discovery and querying of system components These tools include the Grid Index Information Service (GIIS), which knits together arbitrary information sources to present a coherent system image that the user can explore with other Grid applications. GridFTP is a high-performance, secure, reliable data transfer protocol optimized for high-bandwidth wide-area networks. Its protocol is based on the popular FTP protocol for Internet file transfers. To meet the heavy data-transfer requirements of Grid users, GridFTP includes additional features and extensions defined in Internet Engineering Task Force (IETF) RFCs. GridFTP benefits from strong GSI security, data channels that are authenticated and reusable, the ability to perform parallel transfers and to resume partial or interrupted transfers, third-party (direct server-to-server) transfers, and command pipelining. GSI enables secure authentication and communication over an open network. This public-key encrypted security infrastructure permits mutual authentication across and among distributed sites, with single sign-on capability. No centrally managed security system is required, and the Grid maintains the integrity of its members' local policies. The Globus Toolkit's implementation of GSI adheres to the Generic Security Service API, a standard promoted by the IETF. A typical series of Grid operations proceeds as follows. The user obtains necessary authentication credentials from one or more sites. After being authenticated, the user queries information services to discover available resources and locate required input files. Next, the user submits requests for computation, for transferring data, for reserving storage or bandwidth, and so on. The Grid monitors progress of these requests and sends the user notification when they succeed, fail, or get delayed.